On January 20, 2015, the Wisconsin Supreme Court released its decision in State v. Alger, 2015 WI 3, which affirmed the Court of Appeals decision. The result is that the standard of Daubert v. Merrell Dow Pharm., Inc., 509 U.S. 579, 597 (1993) that expert testimony must be reliable and relevant to be admissible and adopted in Wisconsin as Wis. Stat. Â§ 907.02(1), applies only to “actions” or “special proceedings” commenced on or after February 1, 2011. In family court, this means that the Daubert standard only apply to post judgment matters if the initial divorce or paternity action was filed prior to February 1, 2011. 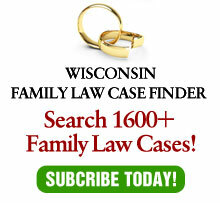 For more on my opinion on the application of Daubert to family law cases in general, see my article in an April, 2011 edition of the Wisconsin Law Journal.